We’ve been seeing Pro Tools 11 running on a HD Native system this week and we have to say the results have been stunning; remember, this is a pre-release version and not the final shipping version we’ve seen. The machine at hand, a mid-range Mac Pro 2.8ghx Quad with a Pro HD Native card hooked up to an Omni. Until production copies of Pro Tools 11 are available, we are not able to offer a review or make videos (trust us we’ve asked—and offered bribes!). However, it’s like seeing a different DAW in action. 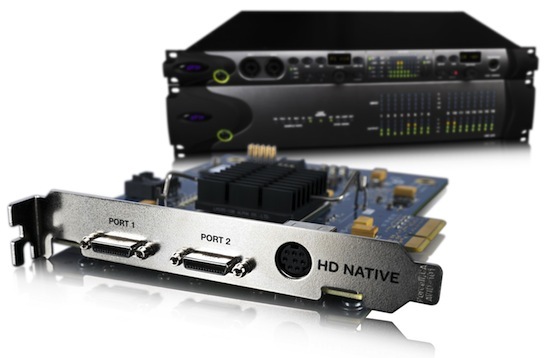 For perhaps the first time since Pro Tools was released, PT 11 makes a HD Native system a really hot proposition. It also continues to make us wonder who will be buying HDX systems? Our best guess is large music, post and broadcast facilities. What is clear is that many of those who had to have a hardware-dependant chip-based HD systems in the past will be fewer. We’ve seen tracking demos sessions running with plug-ins and VIs that were just a pipe dream on previous incarnations of Pro Tools. If you own a store, then I’d advise you to create bundles of Pro Tools 11, HD Native and for composers, Vienna Ensemble PRO 5 (Pro Tools 11 ready) - that is a killer system. If you are thinking of buying a new Pro Tools system, then put all that on your shopping list to check out. If you have a laptop, then don’t forget to check out the Magma chassis. If you think this article is over-zealous fan-boy hyperbole, don’t take our word for it. Wait until PT 11 ships, download the demo, and then see for yourself before you part with your money … just make sure you keep the credit card ready!